Today was the second day of the main Search Engine Strategies conference in London. One of the very last sessions of the day was with Google and contained some key SEO insights. Some SEOs, including this blogger, suggest there is a category of quality signals that could be called “author authority”. This is based on very heavy suggestions from Google via Matt Cutts but is not accepted by all SEOs. What is certain is that Google has a new(ish) markup that lets qualified authors connect their content with their Google+ profile and have this connection displayed in the search results. Google did not confirm (or re-confirm) today that there was a quality signal collection for authors or that there was a connection between ranking signals and author markup. This is in-line with Google’s typical communication/no comment on the details of their algorithms even though they have previously blogged that trust and expert authors are factors that the Panda examines. However, Google encouraged publishers to make use of the author markup. The exact word used was: behooves. If you are a publisher then it behooves you to use the author markup. In response to a challenge from the audience, Google admitted that they are looking to expand the profile connected with the author from Google+ to include other social profiles. Such a move would likely be covered extensively by press and would help ease anti-competitive concerns. It is one to watch carefully. Disclosure: Google’s initial commends on this were in response to my question, although the presentation later revealed a prepared slide which confirmed the original statement. Google currently supports an initiative called the AJAX crawling scheme. This encourages site owners to run a headless browser and map user friendly URLs to exposed rich content within AJAX sections of sites. HTML 5 offers web designers an alternative to some of the more widely used AJAX techniques today. Google confirmed that they will continue to support the AJAX crawling scheme. In addition, Google will add pushState support to their crawling. This is to ensure compatibility with some HTML 5 techniques. Googler Ian Hickson is liaising closely with HTML 5 development and Google’s crawling team. Expect Google to blog on this topic in the (relatively) near future. Google had already confirmed that social signals impact SEO although there was some debate about this again at this week’s conference. 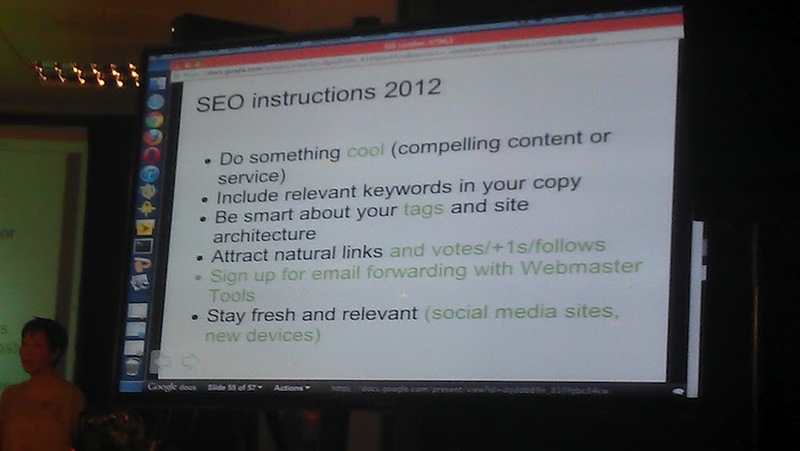 In Wednesday’s session, Google revealed a set of bullet points that represent SEO tips for 2012. The green text is used to highlight especially important tips or new additions. This photograph clearly shows that follows, +1s and ‘votes’ matter. What counts as a vote was not discussed. In addition and as an expansion to having relevant content was the suggestion that social media news sites and devices are a consideration too. The session made explicit mention of the problem the search engine faces when slow websites are returned high in the results. Google admitted that they considered marking slow sites with a red dot, average loading sites with a yellow dot and swiftly loading sites with a green dot in the SERPs so users could see in advance. However, this suggestion was rejected due to a number of concerns – including how webmasters would react to such a public branding. Wait, wait... was all this revealed in a secret session? This was not a secret session. Instead, this season was headlined as “Getting to grips with HTML5” and was presented by Google’s Maile Ohye. Maile is a name that all SEO agency bods should know. Running in competition to this HTML 5 was a popular debate as to whether SEO was dead (or whether it just needed a new name). It was this session that attracted the most attention. On one level this is ironic – an echo chamber of SEOs debate whether the traditional concept of SEO has a future while, just a few metres away, through just one door, Google is discussing the HTML 5 future and the SEO implications of that. It is important that the SEO community do recognise that SEO has changed incredibly over the last few months. We’re swiftly moving towards the point where old SEO is redundant and new SEO is not a widely held skill. The additional technical requirements that HTML 5 may bring to SEO are good news for an industry looking for reasons to show its value whilst also being a challenge to individual SEOs hanging on to the past.